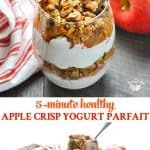 A healthy breakfast or snack is ready in just 5 minutes with this easy Apple Crisp Yogurt Parfait! 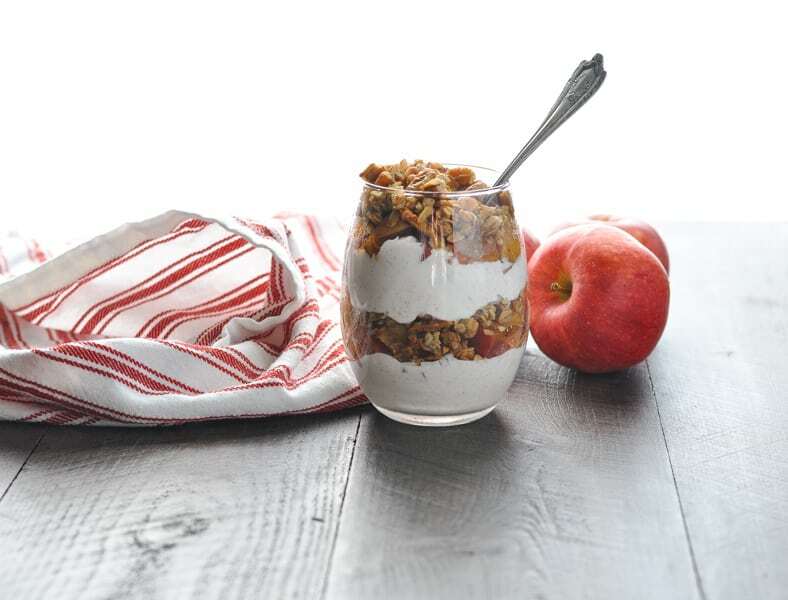 A 5-minute Healthy Apple Crisp Yogurt Parfait is a delicious breakfast, snack or dessert that you can prepare in advance and enjoy on the go! Loaded with protein from Greek yogurt, fruit, and healthy fats, it’s a satisfying and nourishing meal prep option that you can whip up whenever the craving strikes! As with about 99% of my meals, this healthy Greek yogurt parfait comes together super-fast with some basic pantry ingredients. It sounds fancy, but it’s definitely NOT. The microwave does all of the work, and then you can simply assemble and devour! WHAT IS IN A PARFAIT? You probably already have everything that you need just waiting for you in the kitchen! 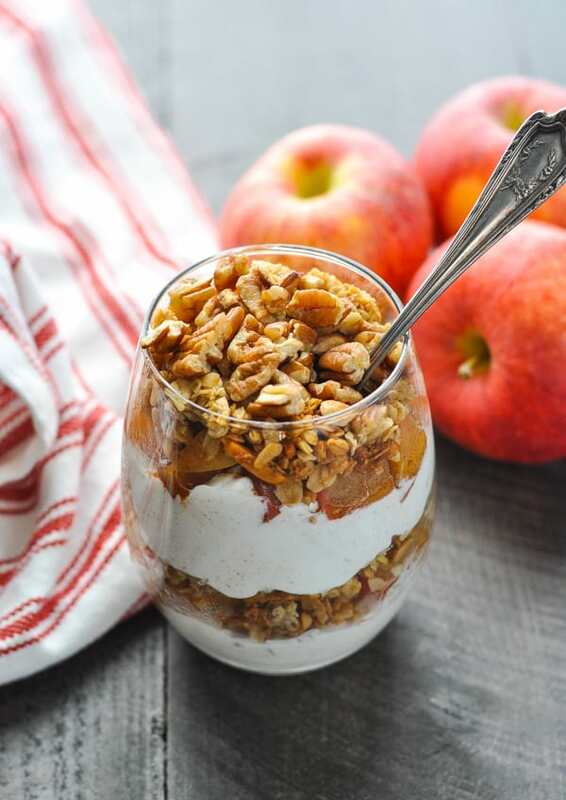 This Apple Crisp Yogurt Parfait is made with plain or vanilla Greek yogurt, toasted pecans, apple, cinnamon, and a crunchy topping like naturally sweetened granola or Grape Nuts cereal. Dice an apple and place it in a microwave-safe dish. Sprinkle it with cinnamon, cover, and microwave on high for about 1-2 minutes, or until the apple is soft. The cooked apple will already make your kitchen smell like a crisp is baking in the oven — and it only takes a minute! Allow the apple to cool slightly before you assemble your parfait. I love how the juices naturally thicken as the apple cools. It’s like a cinnamon apple syrup for the parfait! While the apple cools, combine the yogurt with a dash of cinnamon. What kind of yogurt is used in a parfait? I prefer a plain Greek-style yogurt, because I think that the apples add enough sweetness on their own. If you want this to taste more like a dessert, though, go with your favorite vanilla flavored yogurt. Greek-style yogurt is nice because it’s thick and creamy, and holds up well in the refrigerator (if you’re prepping ahead). If you prefer regular yogurt, that will work too! Now it’s time to layer! 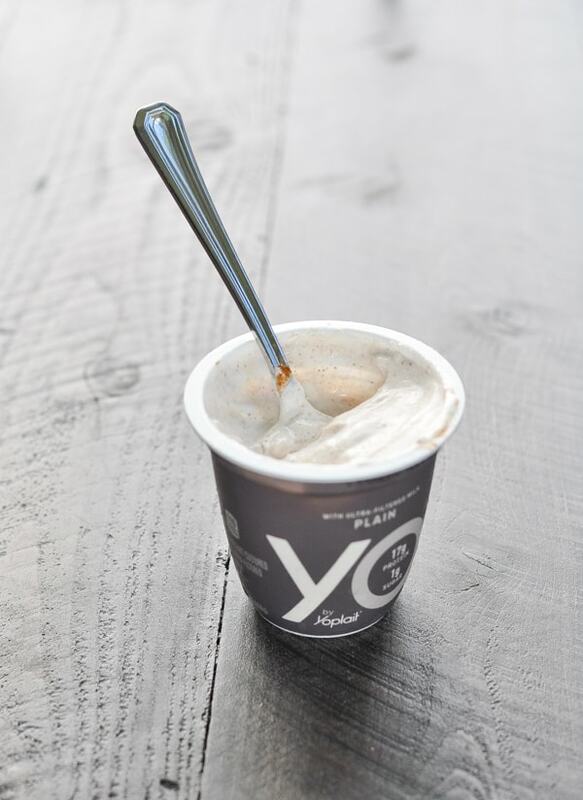 Place about half of the yogurt in a bowl, glass, or mason jar. Top with half of the cooked apple, half of the granola, and half of the pecans. Repeat the layers and you’re done! If you want to prepare the yogurt parfait in advance, I suggest that you leave the granola and pecans in a separate bag or container. 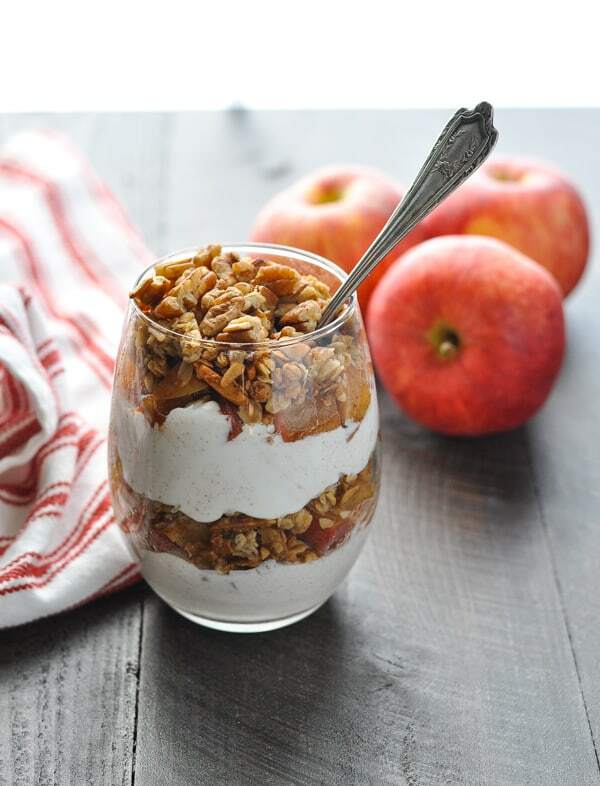 Just layer the yogurt and apples in a mason jar with a lid, saving the granola and pecans to add on the top when you’re ready to eat. This prevents the granola and nuts from getting soggy as the parfait sits in the refrigerator. This is a method that can be adapted to suit any taste. You can use your favorite in-season fruit, including fresh berries, peaches, or plums. If using berries or peaches, you don’t even need to microwave them before layering your parfait. Try different flavors of yogurt! There are so many options right now, so feel free to play around with an apple cinnamon or maple-flavored yogurt, for example. Mix up the crunchy toppings! Try toasted walnuts, peanuts and a drizzle of chocolate syrup, or even pistachios. If you don’t want to use granola, pick your favorite crunchy cereal or go with crushed graham crackers or cookies. 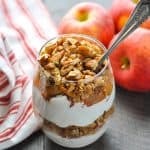 You can’t find a breakfast, lunch, or snack that’s more delicious than this Apple Crisp Yogurt Parfait, and it’s all ready to eat in about 5 minutes! 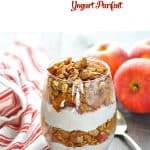 If you’ve tried this Healthy Apple Crisp Yogurt Parfait or any other recipe on The Seasoned Mom, then don’t forget to rate the recipe and leave me a comment below! You can follow me on Facebook, on Instagram, on Pinterest, and on Twitter! 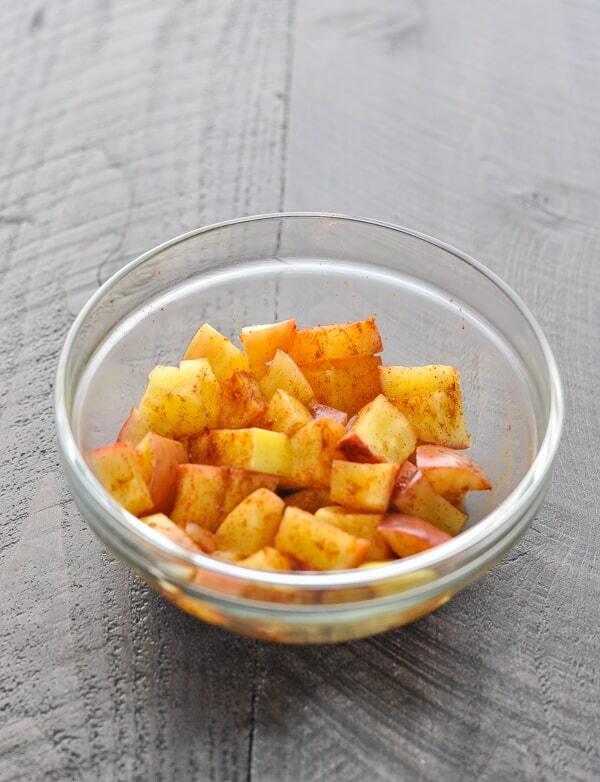 Place diced apple in a microwave-safe bowl. 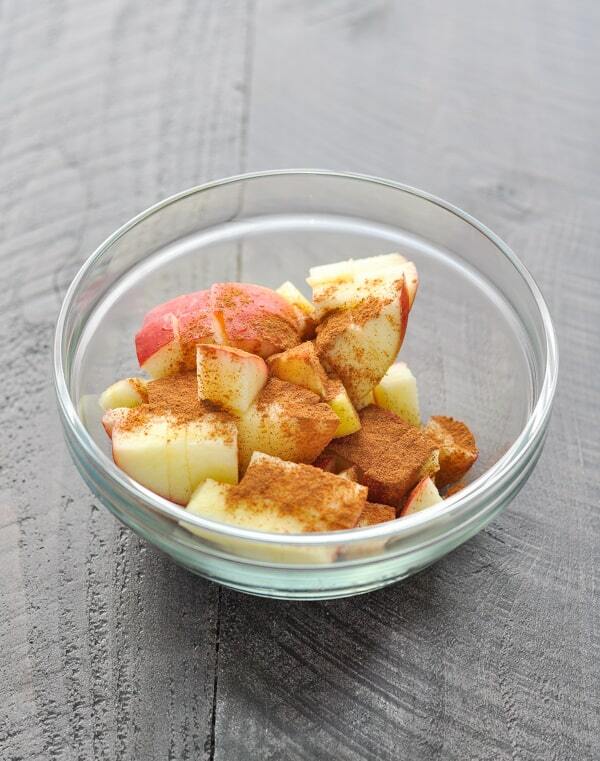 Sprinkle with cinnamon, cover, and microwave on high until apple reaches desired softness (approximately 1-2 minutes). Allow apple to cool for a few minutes before assembling the parfait. Sprinkle yogurt with a small amount of cinnamon and stir to combine. Place half of the yogurt in the bottom of a glass or bowl. 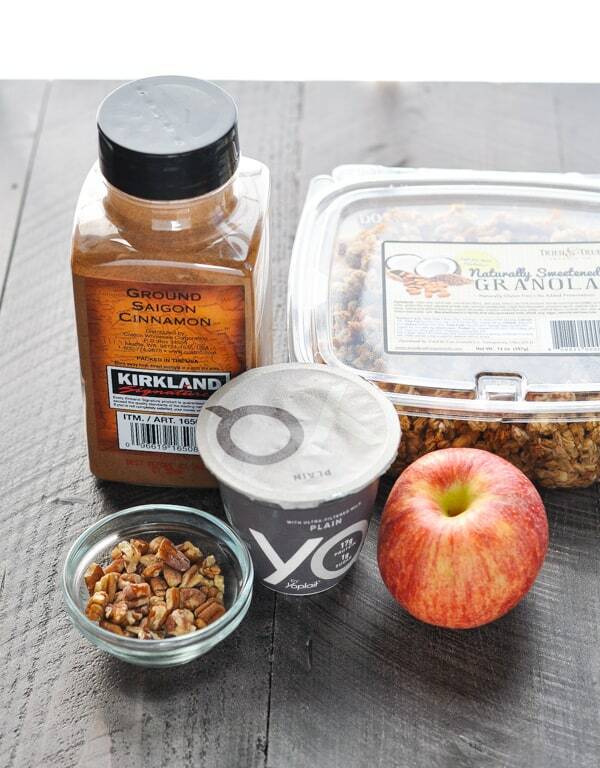 Top with half of the cooked apple, 1 tablespoon of granola, and 1 tablespoon of pecans. Repeat layers with remaining ingredients. Serve immediately. If you want to prepare the yogurt parfait in advance, I suggest that you leave the granola and pecans in a separate bag or container. 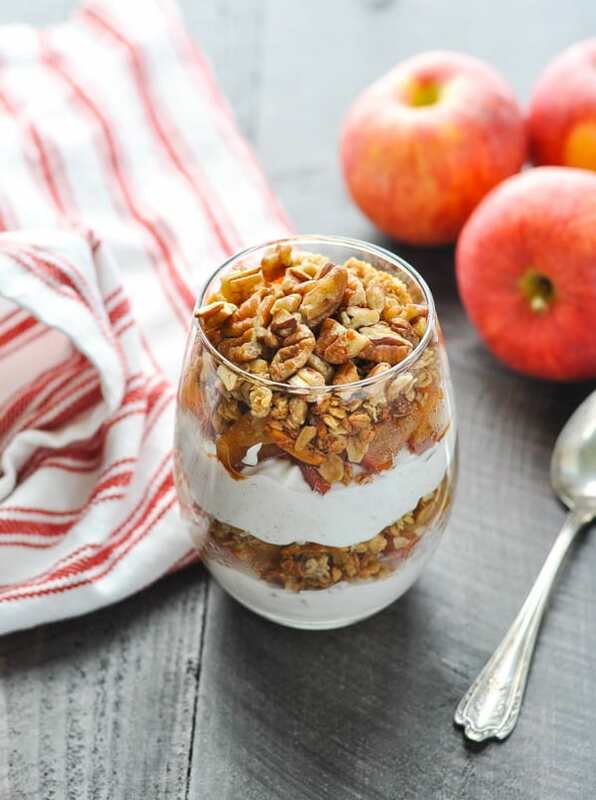 Just layer the yogurt and apples, saving the granola and pecans to add on the top when you're ready to eat. This prevents the granola and nuts from getting soggy as the parfait sits in the refrigerator. This is a method that can be adapted to suit any taste. You can use your favorite in-season fruit, including fresh berries, peaches, or plums. If using berries or peaches, you don't even need to microwave them before layering your parfait. Mix up the crunchy toppings! Try toasted walnuts, peanuts and a drizzle of chocolate syrup, or even pistachios. If you don't want to use granola, pick your favorite crunchy cereal or go with crushed graham crackers or cookies. This recipe was originally published in January, 2014. It was updated in September, 2018. Mmmm, I love parfaits for breakfast, and this looks super delicious! Thanks so much for sharing this at the Creativity Unleashed party, I’m pinning this for sure! We love breakfast parfaits with berries or mangos and coconut flakes. In the fall we use applesauce but I love the idea of using an apple. So yummy and healthy! Delectable! Made this as an evening snack last night and enjoyed every bite. Can’t wait to have it again!